You’ve probably heard of “curb appeal” – and maybe even seen a few houses that definitely have it – but have you ever thought about what curb appeal actually is? When you’re thinking about buying a home, you want to make the best possible decision for you and your family, and that includes being able to determine whether a home’s curb appeal represents the rest of the home, or if the home doesn’t quite have what it takes to live up to its gorgeous exterior. So, let’s break down the elements of curb appeal, and figure out what matters…and what may look pretty, but ultimately doesn’t add value. One of the first things many homebuyers notice is gorgeous landscaping! Flowers, shrubs, and other plants can attract the eye and make a home’s exterior really shine. However, don’t get caught up in the pretty flowers. Many home sellers plant flowers as a way to add some color to the home’s exterior, but once the flowers fade, they won’t continue to add value (unless they’re perennials) – and you may wind up dealing with a lot of dead plants at the end of the season. Value-adding plants like shade trees, rose bushes, and perennials. Mulched flowerbeds, raised garden beds, and other more permanent features, including trellises, pergolas, and other built structures. Brightly colored flowers, especially annuals that will die. Potted plants, which will likely be taken when the seller moves. Removable window boxes, which may also be taken when the seller moves. The actual structure of the home is obviously an excellent thing to examine when buying a home! Aging siding that’s falling off is a red flag, as are broken or obviously damaged windows. However, the particular color of the siding, windows, and doors matters less, as this can be changed. Most exterior materials, including brick and vinyl, can be painted. Any exterior elements should be in good shape and firmly attached to the house. Doors and windows should be in good shape and not visibly broken nor have major gaps. The color of any particular element, such as the door. The style or finish of the house numbers. Window treatments that are visible from the outside. How you enter a home is important! Do the walkways and driveway feel sturdy and well-cared-for? Chips and cracks may cause issues down the road, but can also be fixed relatively easily. It’s up to you to decide if this is a problem! You should be able to safely enter the home. Stairs should be in good shape and feel sturdy. Major cracks, chips, and other obvious signs of decay. The grade of the driveway and any walkways – will you still feel comfortable getting to your home when it’s icy or snowy? Small cracks or chips, provided you’re comfortable getting them fixed. Any stains or glosses applied to surfaces – these can be easily applied and changed later. Any fences and gates on the property should function well for their intended purpose – to keep things in or out, and to allow you passage through. Gates should open easily and not stick or hang crookedly. Fences should be in good condition, without large holes, gaps, or areas that are sagging or falling over. Does the fence height match your needs? A short fence may not work for a big dog – or an 8-foot fence might be overkill! An entire fence that you consider to be an eyesore – some people just don’t like them! The color of the fence or gate, as long as it’s sturdy. This can typically be changed by painting or staining. Small holes in most fences – these can be repaired fairly easily. 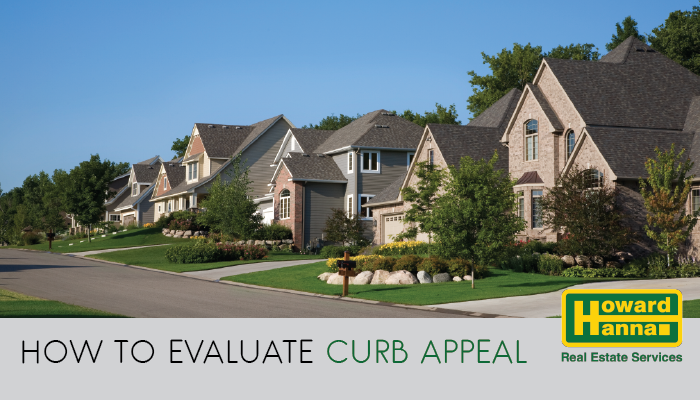 Remember, most home sellers put time and effort into making sure their home has curb appeal for a reason. They say that most potential buyers will decide if they’re going to purchase a home within 8 seconds of seeing it, after all. However, don’t let a nice-looking exterior disguise larger problems with a home. Make sure you’re aware of what to look for when you attend open houses and home showings to ensure that the home you love now, you’ll love for as long as you live there.